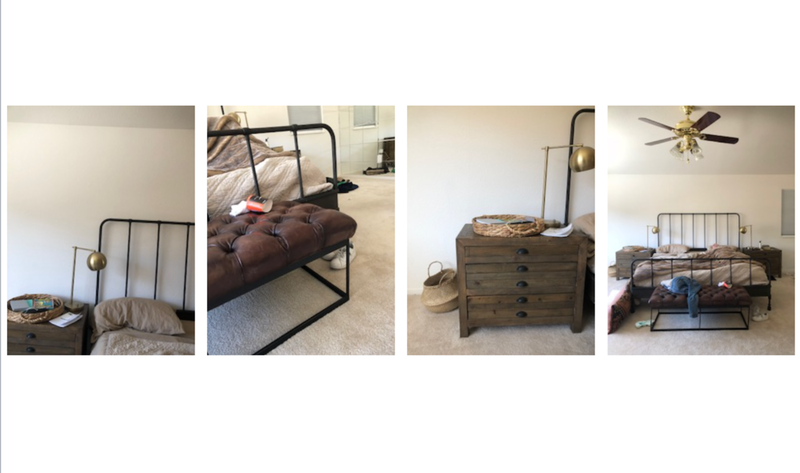 I’m so excited to help you redesign your bedroom and create the perfect cozy, layered bed and curated nightstands. I see this as a space where you and your husband can hang out and relax at the end of day and a space that's welcoming for your kiddos to come and snuggle on a slow weekend morning. I love that the desert is a place of such rich inspiration for you. 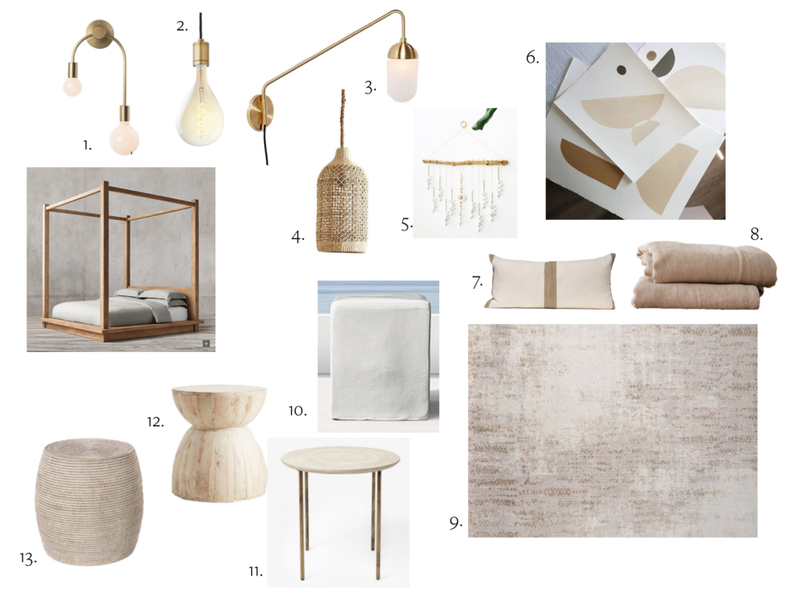 Let's create a comfortable yet minimal space inspired by desert hues, natural materials, and gathered objects. I want this space to offer a sense of balance —a mix of wood and linen, bold lines and delicate curves, a space that's both earthy and artistic, and intentional yet casual. 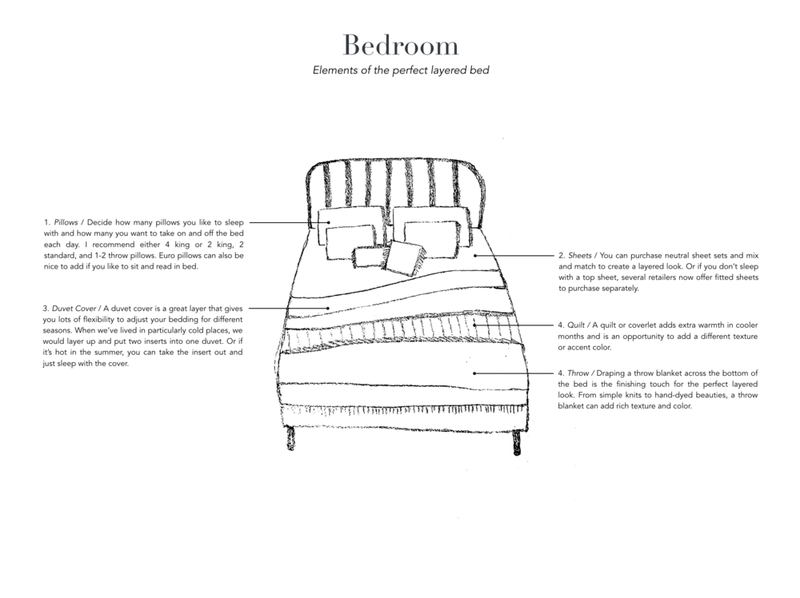 The following images/video will walk you through creating a perfectly cozy and beautiful layered bed. 1-4. Here are some more brass lighting options. All of these are plug-ins so you can hang them up and then take them with you when you move! With 1 & 2, you can change the shape of the fixture a bit depending on what kind of lightbulb you choose to use. (And I'm happy to make a recommendation if you want to go this route.) #3 swings out from the wall, which could be nice if you like to read in bed, so that the bed frame isn't blocking any light. And #4 is a woven pendant that you could hang using a small hook from the ceiling over your nightstand. 7-9. Pillow, blanket, and rug from previous design round. 10-13. Here are a few nightstand options with a more natural feel. #10 literally brings the outdoors in a bit, it's a cast ceramic table from Restoration Hardware. I like the organic feel to it, and it's incredibly affordable. #11 is a table from Mos Design. The tops are made by artisans from stucco and wood. #12 is handcarved of bleached wood. And #13 is a rattan stool, that's also very affordable. Everything is also pinned here if you want to check out links or more details! Let me know what you like! If you want to email me with the numbers that are your faves, I'll put together a final board, layout, and pricing for everything.